Interresting. So no rain? But mist/fog/steam rising from the lava beds? Here is something I've never seen since, but I've been told by an amateur meteorologist friend of mine that it's not all that uncommon. If there is enough moisture in the air and if you can catch the sun's angle exactly right, you can find mini localized rainbows. The physics is the same as a 'normal' rainbow. It's just that the phenomena is much more localized. I was coming up a steep hilll and the sun was rising in front and off to my right. To be truthful the minibow was a bit fainter than shown here, I boosted the red and blue saturation levels to make it stand out a bit more, but it was really there. Fairly warm and dry, though a little overcast earlier in the day. 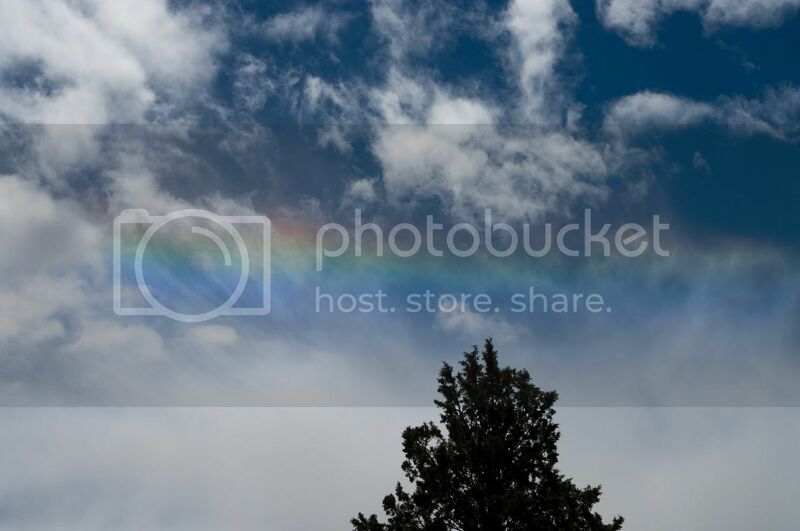 I only noticed the rainbow as I was shooting something else and turned around...It seemed too high up to be mist or anything from the lava beds. Well, I asked because I wondered about the source of the rainbow. It looked like (in the 2nd shot with the tree) there were some fog/mist below the rainbow? Normal cloud or fog drops are too small to create rainbows. Rain drops are large enough. But also drizzle drops can be large enough, and it is quite common to have drizzle sized droplets form in the top of fogs (due to coallescence = collisions between droplets). 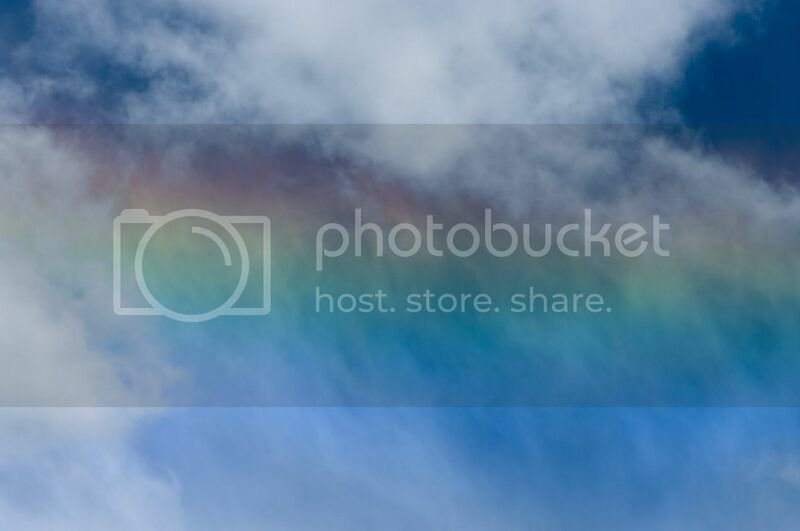 In this case, we talk about a fogbow. If this is not the case, you probably had rain or drizzle falling somewhere near you. It looks like both your's and NaClH2O's (to an even more extreme degree) are examples of low angle rainbows. When rainbows form from a drop source quite close to the surface you see a shallow rainbow that does not have much of an arc. Typical example is when you water your garden. But I'm a bit confused by NaClH2O shot where it looks like it is quite cold and hoar frost in the picture. Super cold rain? Douglas, it actually wasn't that cold, just a bit below freezing, maybe -1 or -2 C. I had snowed lightly the evening before, I think that is what you see as hoar frost. It was cold enough that the snow wasn't melting, in the shade and maybe 1/2 hr after the sun got high enough to cast some shadows (maybe 2hrs after sunrise, it is a heavily wooded area and the sun has to get high enought to penetrate the tree cover) I remember because I was hoping to get some snow on flora pictures in the sun and had to work fast because as soon as the sun hit the snow, melting was happening. From memory it was taken the day or so after my DA14mm arrived in the mail. I'm not sure if the image would benefit from some tweaking in LR to pull out the underexposed road. Funny enough I have not seen a sun halo since. With reference to rainbows, I've seen a fair few rainbow halos when above light cloud in the hang glider. And, no, I have not taken up the K10D with the 14mm to try get handheld shots! YIKES! I imagine that would sorta be like texting while driving a formula 1 car during LeMans! 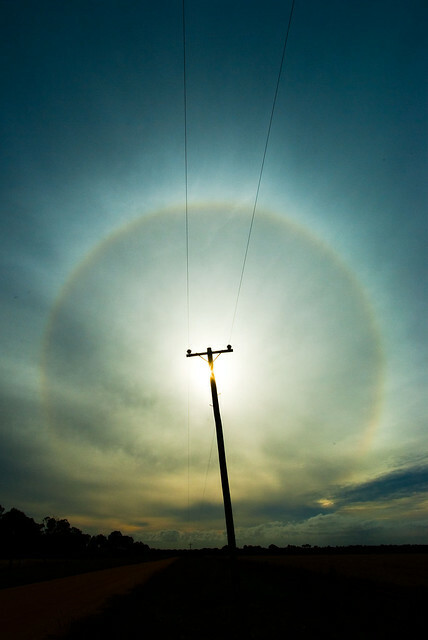 A realy beautifull halo shot! And creatively composed as well! well this is all I've got, moon halobowsomething! Like this one. You know, plenty of people don't even know the moon can make a halo! You should get one of those helmet cameras! 1) Either a normal rainbow. But because of your high position you can see a whole circle (in very low positions you see less and less of the ark). How to recognise it? It is centered around your shadow with the highest light intensity at a distance of 40-42 degrees from centre (the shadow). 2) A Glory. Like for a rainbow you see a circular spectra, also centered around your shadow, but only at some 5-10 degrees from the shadow. The process is disputed, and it appears that it can be either droplets or ice chrystals that cause it. In some occasions you can see a glory around the shadow of someones head, which may be the origin of different mythological ideas about glorys. In case you want to spot the glory without being a hangglider, figure out what will be the shadow side of the airplane when you fly somewhere and book a window seat on that side. It is quite common. Keep on watching the air plane shadow as it move over the cloud tops, and you will eventually spot it. Indeed the circles I see are rainbows as described. I'll have to do some neck exercise work to hold my K10D and that 14mm as a helmet mount! I'm off to warmer climes flying next month, will see if I can wing mount the lens.